Zellnor Myrie is running to represent New York State Senate District 20, which includes parts of nine Central Brooklyn neighborhoods. He is running against Jesse Hamilton. "Zellnor Myrie is a Brooklyn native, lawyer, and longtime affordable housing advocate. Zellnor derives inspiration for his public service from his mother who moved to Brooklyn 40 years ago from Costa Rica on the promise of a mattress in a friend’s apartment and a job at a factory. His father has been a special education teacher for the past 17 years, and is a current member of The United Federation of Teachers. Zellnor was raised primarily by his mother in a rent-stabilized apartment in Prospect Lefferts Gardens allowing him to attend one of the best public schools in the borough." In July 2018, Sunrise NYC hosted a meeting at Zellnor Myrie's campaign office. "Come join us for painting, music, pizza, games, and hanging out with cool Sunrise NYC folks at Zellnor Myrie's new campaign office! "We're starting with a brief Sunrise NYC 101, so if you wanna learn how to get plugged into our movement to help us make climate change an urgent priority in the upcoming elections, COME ON TIME! Plus we need to get a pizza count!" According to the Facebook invitation, Saradine Nazaire, Izzi Graj, Chua Zi, Drew Magnolia Arnum, Miles Goodrich, Julia Epstein, Madison Daisy, and Dann Ette attended the meeting. Zellnor Myrie participated in the #FamiliesBelongTogether march on June 30 2018. On Facebook, he thanked the sponsors of the rally, the New York Immigration Coalition. Our Revolution endorsed Zellnor Myrie. Working Families endorsed Zellnor Myrie, along with other New York candidates Jessica Ramos, Alessandra Biaggi, Rachel May, Robert Jackson, John Duane, and Jasmine Robinson. In April 2018, Rise and Resist hosted a rally for Zellnor Myrie. "Join us as we rally for Zellnor Myrie, our next state senator in District 20. Myrie, members of grassroots groups, and Democrat voters will meet near Prospect Park for a short rally and voter education. "The Independent Democratic Conference (IDC) may have rejoined the Democrats for now, but they've been willing to ally themselves with the GOP since 2011 - and they've claimed to return to the Democratic fold before. New York deserves REAL Democrats who stand for progressive values, not Trump Democrats." 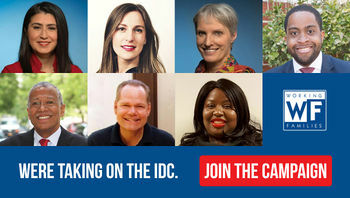 In April 2018, IDC challengers Jessica Ramos, Robert Jackson, Alessandra Biaggi, Rachel May, Jasmine Robinson, Zellnor Myrie and John Duane released a letter to the Independent Democratic Conference, which is perceived by progressives as a conservative wing of New York lawmakers, which consist of Marisol Alcantara, Tony Avella, David Carlucci, Jesse Hamilton, Jeffrey D. Klein, Jose Peralta, Diane Savino and David J. Valesky. The letter derided the members for blocking a budget that would have allotted funds for issues like climate change, transgender rights, funding for illegal immigrants to go to college, and gun control. March 1st, 2018, New York, Today, more than 60 New York grassroots groups endorsed the following challengers to five members of the New York Senate’s Independent Democratic Conference (IDC): Alessandra Biaggi (District 34, Bronx and Westchester), Robert Jackson (District 31, Northern Manhattan), Rachel May (District 53, Syracuse area), Zellnor Myrie (District 20, Brooklyn), and Jessica Ramos (District 13, Queens). The newly formed True Blue NY Grassroots Coalition is a diverse network of groups that have mobilized statewide with a unified goal to defeat the IDC. Coalition leaders spoke out today at a press conference at City Hall in Manhattan. The Coalition will eventually endorse challengers for all of the districts represented by IDC members. “We stand here today not just because of stalled legislation in Albany, but because the IDC has been costly in other ways. Senator Jeffrey D. Klein and Independent Democratic Conference divide the Democratic Party when unity is paramount. We also stand here today because we’ve decided it’s time to take back our government and our Party,” says Carmela Gaines of Queens Huddle. THIS. IS. HUGE. Sunrise-endorsed candidates Zellnor for New York and Alessandra Biaggi won their elections today. After months of door-knocking, making calls and texts to voters, we just might create the conditions to flip the Senate in New York State and have the votes to pass the strongest climate legislation in the country into law. This page was last modified on 22 December 2018, at 22:24.